Originally published by Revolution Permanente. Edited machine translation by Enough is Enough. Paris: Parallel to the yellow jackets demonstrations at Place de l’Etoile and the Champs-Elysées, a second march left this afternoon from Gare Saint-Lazare to head for Tuileries. On board, of course, Yellow Jackets, but also the Adama Traoré Committee, railway workers and students. they try to give a new voice to this mobilization. 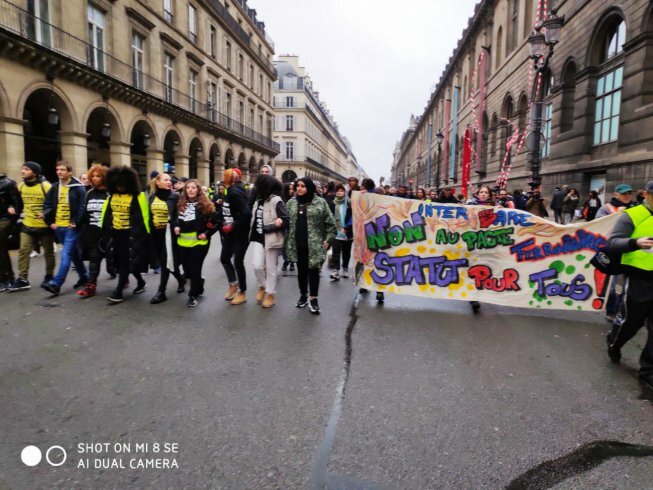 The Truth and Justice for Adama Traore committee called for a demo in Saint-Lazare this afternoon, where Youcef Brakni, an activist of the committee and popular districts, explained the reasons of this connection with the Yellow Jackets mobilization. “In this movement we must make clear demands that fights for social justice and against inequalities” . Alongside the Adama committee, the Anti-fascist Action Paris Banlieues, or Banlieues Respect came to deliver a message: “As inhabitants of the working-class neighborhoods, we are more than just concerned about the unequal and ultra-liberal policies of Macron’s goverment”. These anti-racist collectives express economical and social demands that meet the concerns of the Yellow Jackets. Youcef Brakni, who will attend at the demonstration with Assa Traoré and writer Edouard Louis (members of the Adama committee), this afternoon, “added the question of racism and police violence, of those victims who die in the hands of the police and the gendarmerie”. With the level of repression shown by the government against the Yellow Jackets, the denunciation of police violence on which the Adama Committee was formed could find a new echo. Standing behind these goals in Saint-Lazare are the Adama Traoré committee, but also the collective of the Parisian railroad workers, formed during the rail battle of last spring. The latter had called to join the Yellow Jackets mobilization “for the defense of spending capacity, wages and public services” dismembered by the Macron-Philippe government with the latest SNCF (French Rail Company, EIE) reform. By the end of the morning, yellow and orange vests were gathering in the Grands Boulevards district, first several hundred, then by the thousands to try to breakthrough to the Champs-Elysées. After walking along the Parisian Grands Boulevards, the diffuse demonstrations of Yellow Jackets, railway workers, activists from popular neighborhoods, including the Adama committee arrived at the level of the Opera. In its progression, the yellow-orange-anti-racist event became tinged with pink, with some feminist and LGBT collectives visible with their banners. Several student demonstrations, from the gathering at Pantheon called for by the Unef union, were also there to make their voices heard. They raised their voices against rising tuition fees for foreign students and announcements concerning the rise in tuition fees for a Master degree. Last week there were calls for General Assemblies in several universities: Paris 1- Tolbiac, Paris 8 Saint -Denis, at Nanterre or the Ecole Normale Supérieure for study centers in Paris. Thousands of yellow jackets, young, orange or pink were marching in the streets of the capital this afternoon. Parallel with the rallies Place de l’Etoile and the Champs Elysees. From Saint-Lazare, to the grand boulevards, to Opera and then to Tuileries. Around 4 pm this massive second group of protesters was stopped by police forces who flooded the street with tear gas. Protesters entered the Tuileries Park to escape the gas.